Jerry Uelsmann, Gay Burke, ca.1971. Image courtesy of the artist. 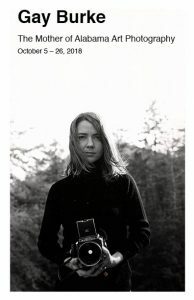 Over four decades, photographer and professor of art Gay Burke developed a distinguished fine art photography program at The University of Alabama Department of Art and Art History, all the while creating her own photographic work. Out of this program came award-winning artists such as Miller Mobley, Janice Hathaway, Wayne Sides, Karen Graffeo, and many others. Burke’s innovative work has been exhibited in more than 80 national exhibitions including numerous solo exhibitions at venues such as the University of Nevada, Las Vegas; the University of California, Berkeley and the School of the Museum of Fine Arts, Boston. Burke studied under distinguished photographer and photomontage innovator Jerry Uelsmann at the University of Florida and worked with renowned documentary photographer Walker Evans. At UA, she was the first woman to achieve full professor status in the Department of Art and Art History. She died in May of 2017. This semi-retrospective exhibition showcases forty works by Gay Burke, some never shown before. Most of the photographs are multi-negative prints. To create them, Burke shot 35mm film photographs, developed the negatives in her darkroom, and then painstakingly combined two, three or four negative images in the darkroom to produce a new image. These photographs, with their often surreal juxtapositions of seemingly unrelated objects, are a result of careful and skillful manual manipulation, long before the days of “photoshopping.” None have been digitally manipulated. Please join us on opening night, Friday October 5, 2018, for a celebration of Gay Burke and a reunion of her former students from 5:00-8:00 p.m. An exhibition of photos by some of her former students, Butterfly Effect: Honoring the Legacy of Gay Burke, will be held at the same time in The University of Alabama Gallery, also in the Dinah Washington Cultural Arts Center, sponsored by the Alabama State Council on the Arts. A one-time pop-up sale featuring hundreds of Gay Burke’s prints will immediately follow the opening reception, also in the Dinah Washington Cultural Arts Center. All proceeds from the sale of these photos will go to fund the annual Gay Burke Memorial Fellowship in Photographic Arts, administered by the Alabama State Council on the Arts. The Arts Council Gallery hours are 9 a.m.-noon and 1-4 p.m. on weekdays and noon-8 p.m. on First Fridays. The University of Alabama Gallery hours are 9 a.m.-5 p.m. weekdays and noon-8 p.m. on First Fridays. Galleries are closed on weekends. Admission is free.